On our recent family vacation to the Southwest, we hit some unexpected nasty weather in Taos, New Mexico. Middle of April: Snow. Yuck. 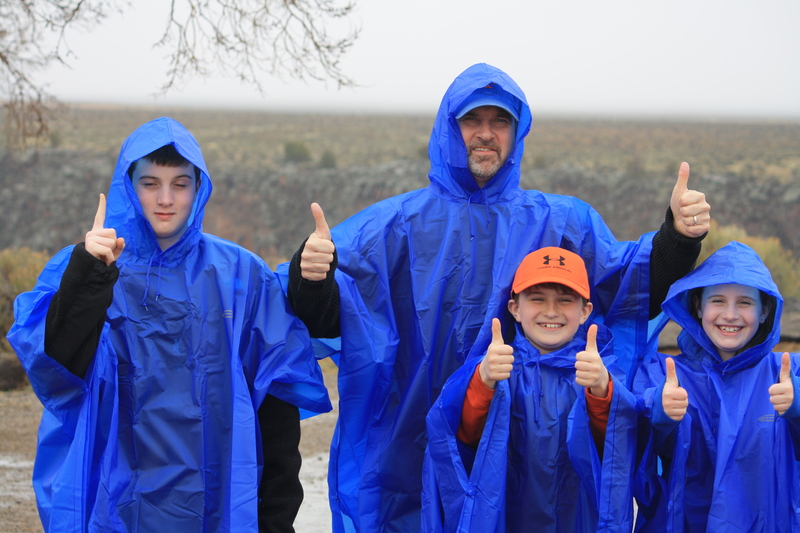 Our plan for that day had been to see the Taos Pueblo, take a hike down a gorge to some hot springs beside the Rio Grande, and generally bask in the environment. But we soon realized that it was cold and wet and miserable. What to do? Answer: Go to K-Mart, buy some ponchos for $5.99 each, and make the best of it! We called ourselves “The Blueberry Gang” and had a great time, all things considered. Next day we headed out of town in search of better weather (and we found it). I have to say — and I hope this doesn’t come off as too vain — but I don’t think Brad pulls off the poncho look as well as we did. The thing is, you have to wear a K-Mart poncho with confidence. You are making a statement. You have to believe. And, yes, even strut. Whereas Brad, to me, it just looks like he’s afraid of getting wet. What’s more, when buying a K-Mart poncho, you have to pony up for the $5.99 model. It looks to me like Brad went cheap and tried to get away with the $1.99 special. A classic “What Was He Thinking?” moment. Even so, you have to give Brad credit for doing the tourist thing, pretending to be a regular guy. But you won’t see me returning the favor: I wouldn’t be caught dead with that handbag. You forgot to mention that Brad now wears a baseball cap and sports a go-tee (spelling?). Will Lisa be getting Botox injections for her lips? 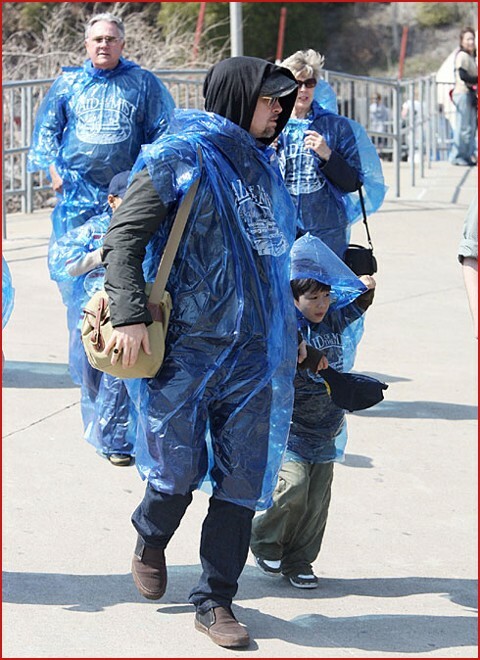 You and the fam definitely win the best dressed over the Jolie-Pitt contingent….